Broadly, the employment report for March suggests that the U.S. economy is growing at a steady pace. Nonfarm employers added an estimated 215,000 jobs, bringing the three-month average to 209,000, more than enough to compensate for natural growth in the labor force. 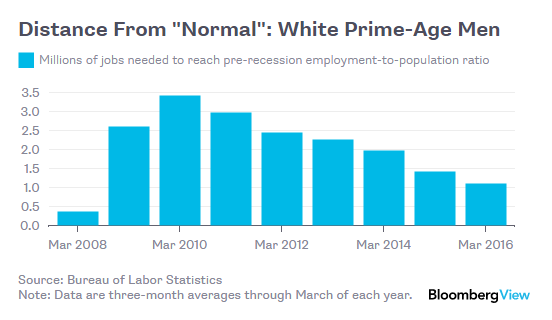 The unemployment rate rose a bit to 5 percent, but for a desirable reason: More people were in the job market, a prerequisite for being counted as unemployed. An increase in hourly average earnings more than reversed the previous month’s decline, fueling hopes that demand for labor will finally translate into better pay. The malaise goes far beyond the political. Most of the prime-age jobless don’t show up in the unemployment numbers because they aren’t actively looking for work — and in many cases are already on disability. 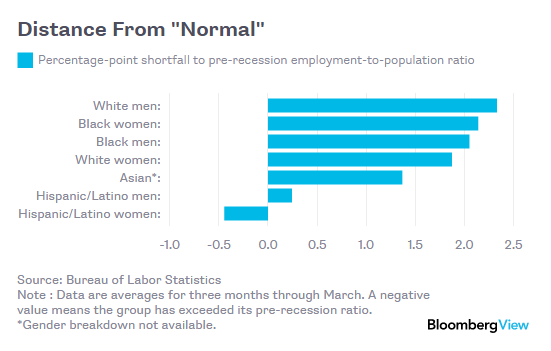 If they don’t get back into the labor force, their absence could permanently impair the economy’s capacity to grow. Economists are split on what policy makers can do. Some think that the Federal Reserve, the government or both should use stimulus to boost economic growth, so the added demand for workers will draw people back into the labor force. Others believe that the motivation-sapping effects of long-term unemployment, among other things, will keep the labor participation rate down — meaning that extra stimulus might lead only to undesirable inflation. Whatever happens, middle-aged white men are a demographic group to be reckoned with, numbering about 48 million (not including those in the military or in prison). The more they feel left behind, the stranger U.S. politics may become.